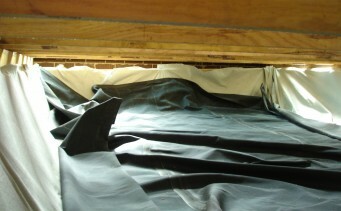 Membranes Australia has been manufacturing Pillow Tanks in Australia since 1978. Our innovative base entry plumbing system simplifies installation, reduces costs, and aids in longevity by eliminating moving parts. It also creates an airless environment which helps prevent bacterial growth providing a clean, effective and concealed water storage system. Long Lasting. Guaranteed for 20 years. Simple & Cost Effective Installation. Butyl Rubber – Suitable for Potable Water. Concealed Installation – Under deck or under house. Can be linked together for greater volume. Custom Made – To suit your requirements.